different route I would try before taking this give-up approach. I don’t recommend taking the plants out before trimming the damaged growth out and at least trying the Sick Tree Treatment, just as we would for diseased trees. 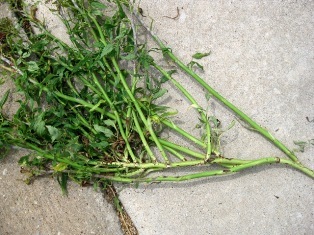 Cut away the diseased stems and clean the tool blades immediately using hydrogen peroxide (never bleach). 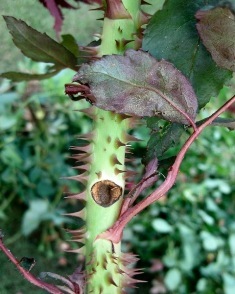 The Sick Tree Treatment should be applied throughout all the rose beds. The addition of granulated garlic at 2 lbs per 1000 sq. ft. is also helpful. A quality commercial hydrogen peroxide based disease control product is BioSafe. I spoke with Howard on the radio roughly August of 2015. 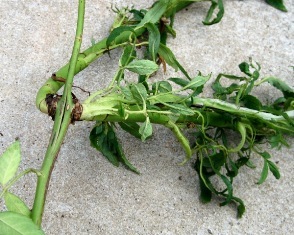 My 100+ year-old Seven Sisters rose bush had rose rosette disease, and I was crushed. I’m the fourth generation to have this rose bush. It’s lived in Muenster, Gainesville, Dallas, and now Plano. 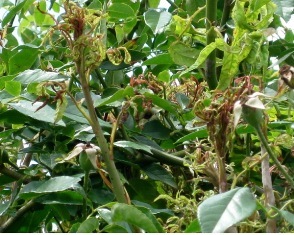 And I lost its only propagation the year before to rose rosette disease, but didn’t know what it was at the time. (I thought the small leaves and blooms were a result of the drought, and didn’t pursue treatment.) When the original bush started showing the same signs, I researched, and felt awful for inadvertently letting the other bush perish. I followed Howard's treatment plan, and it works! 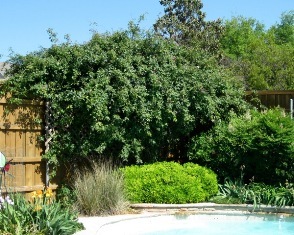 I promised I’d send photos of the treated bush, attached. I treat monthly (on average). During a busy time I missed a treatment or two, and the disease flared back up. But regular treatment is keeping it at bay. 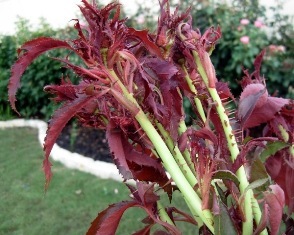 I called you 2 or 3 weeks ago about the Rose Rosette disease on my climbing antique rose. I have cut out the infected cane, applied the Sick Tree Treatment and sprayed Garrett Juice formula containing peroxide, orange oil and biowash. 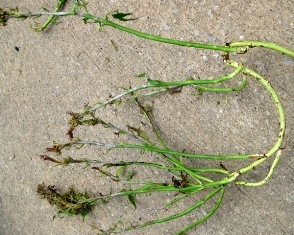 I took a lot of photos of the infected part of the plant. 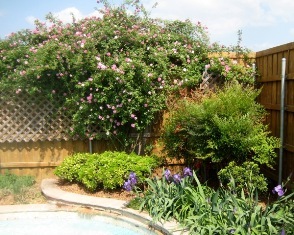 I have been totally organic for over 12 years, but this rose bush is bordering my neighbor's yard. Her knock out roses are also infected and she has not been organic, but is now seeing the light! My knock out rose is doing great, so I'm afraid the problem is due to my bush bordering a non-organic yard. I will keep you posted on the results. 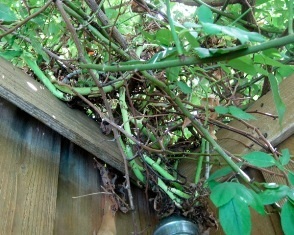 Close up of neighbor's Knockout rose with classic symptoms. Close up of neighbor's infected knockout rose. Not sure if the bore hole was caused by rose rosette perpetrator or something else. 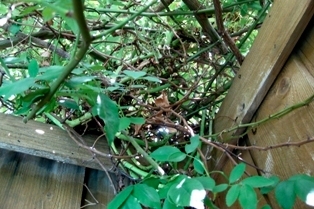 These photos were taken before the infected canes were pruned from bush. Close ups of "witches' broom" branching affect. 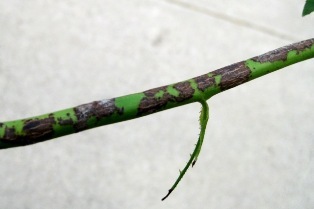 Close ups of infected canes. This is what the infected canes looked like from underneath the bush, looking up. 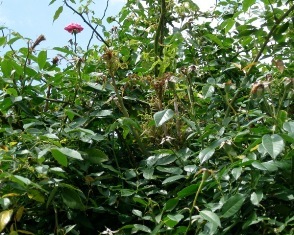 These 2 photos show what the rosebush looked like in bloom last year, as well as what it looks like after pruning out infected cane. 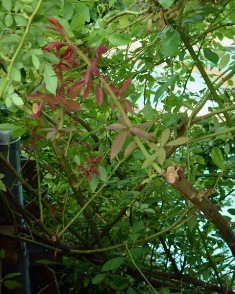 Results: Rosebush is recovering to health and producing healthy new growth.